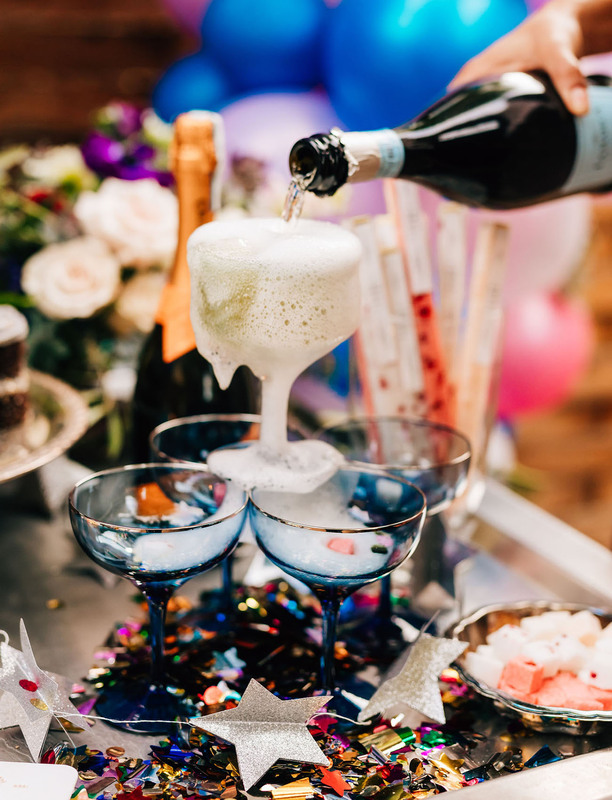 New Year’s Eve is right around the corner and we LOVE a good party here at GWS. 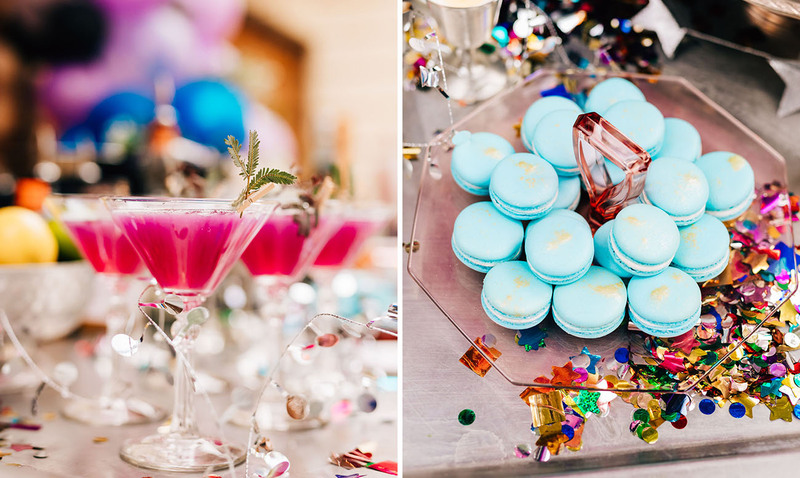 So with the recent announcement from Pantone’s color of the year – Ultra Violet, we saw this party and had to share! 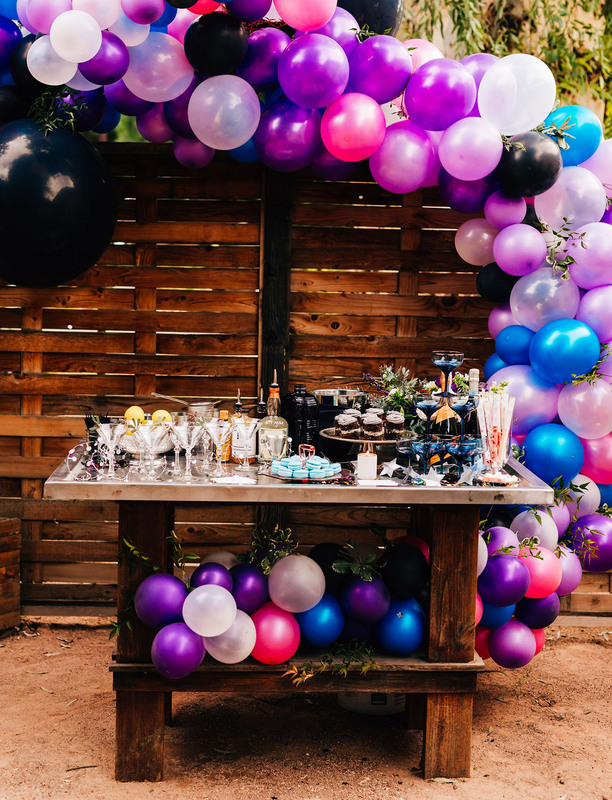 From pops of violet, a funky balloon arch and a champagne tower, this is one Pinterest-worthy party you will want to throw this weekend! Step 1. 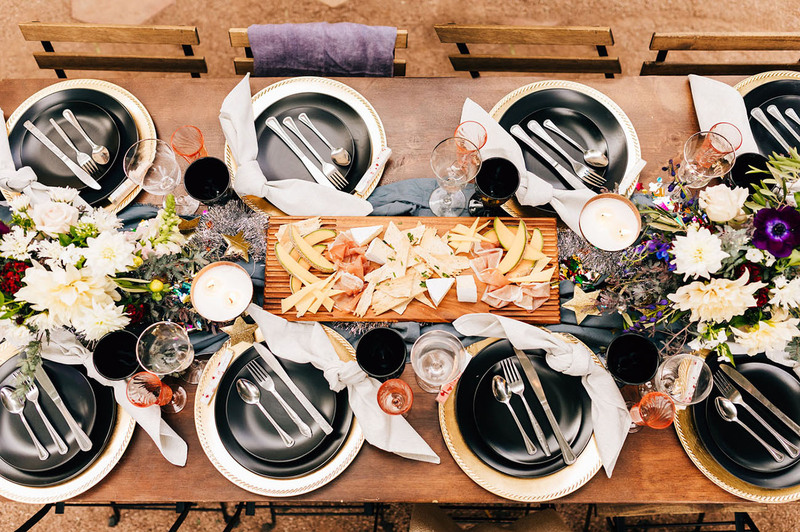 Use What You’ve Got Or Rent: The internet is filled with beautiful photographs of incredible table design with lots of things that most people don’t have. We are here to tell you that it is okay to use what you’ve already got. Have fun with the pieces that you own and play around with different looks. Mix and match your plates in an intentional way. We used some simple matte black plates from Ikea and mix matched vintage silver flatware from my Mothers’ buffet cabinet. And if you don’t have enough of what you need, rent rather than buy. 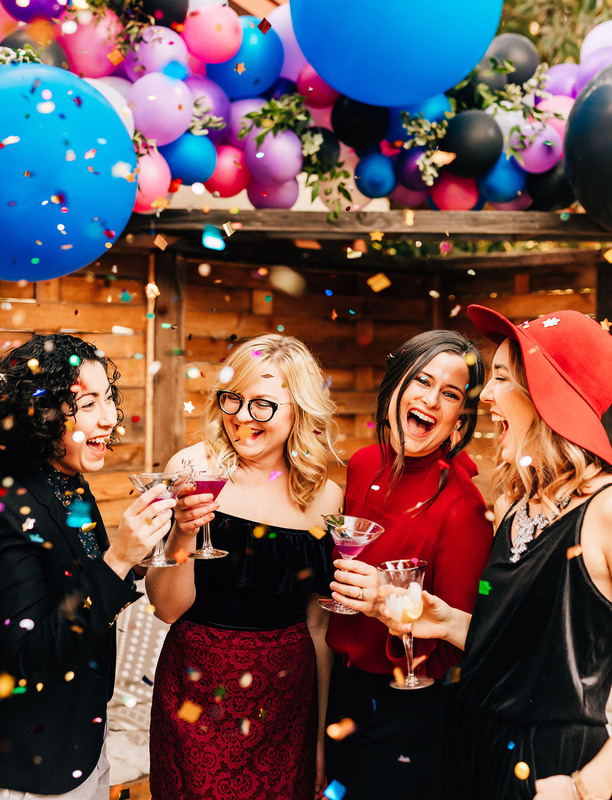 Find a local rental company that can help you fill in the missing pieces or style an entire table that matches your aesthetic for your party. 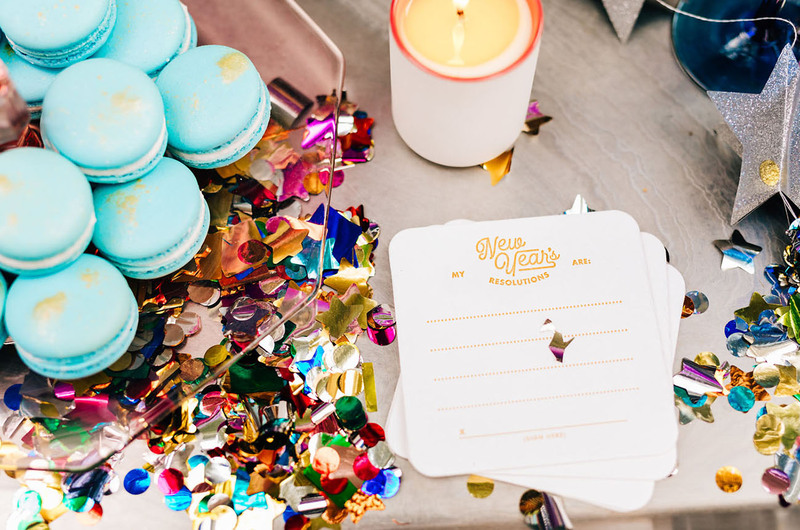 And how cute are those NYE resolution coasters from Prickly Pear Paper? Step 2. 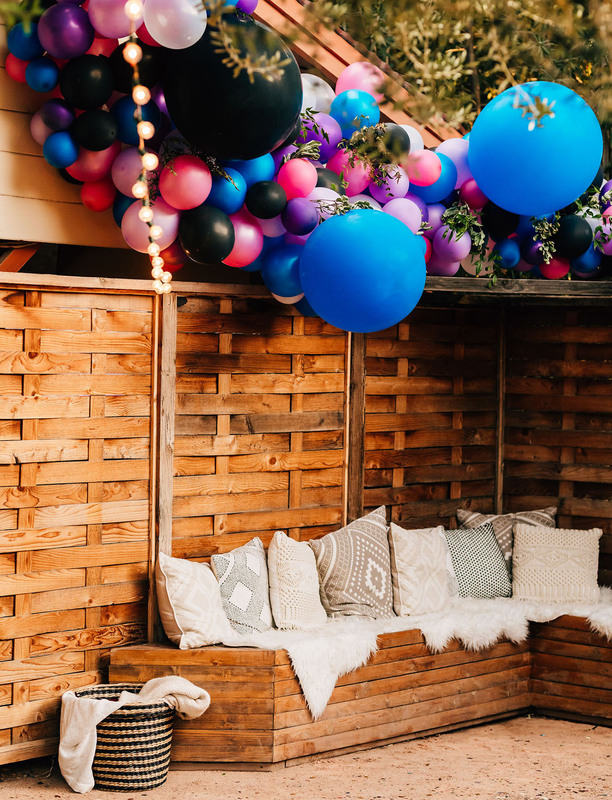 DIY Decor: If you’ve been dreaming up a unique way to decorate your space for your next party, why not incorporate a few DIY’s that will make all the difference in the world. 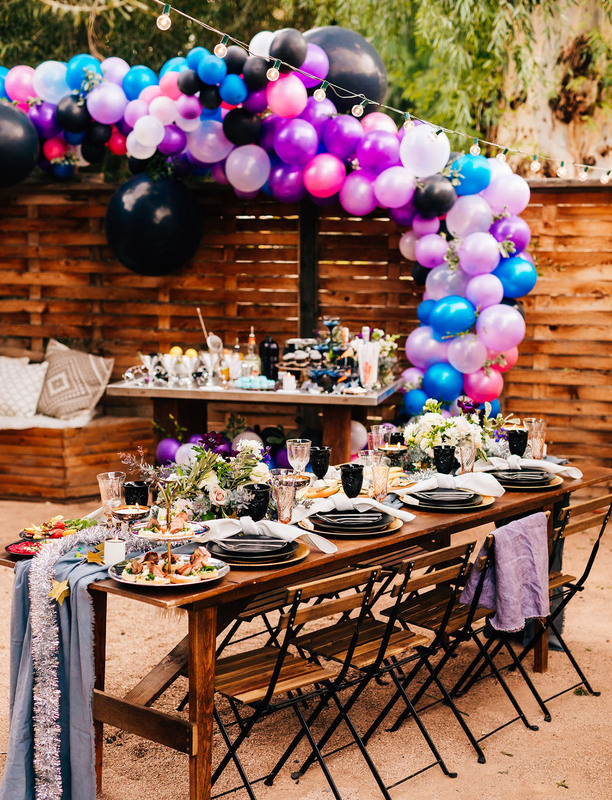 Figure out small (or big) decor touches that you can do yourself; like the balloon garland! 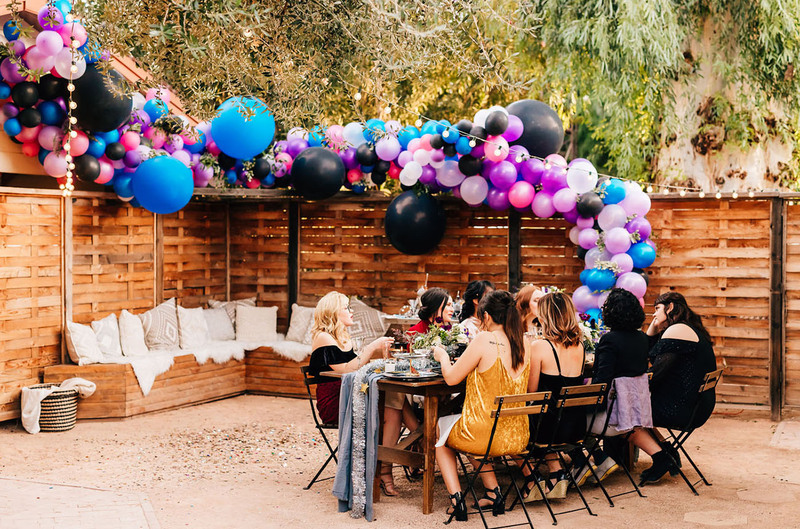 We worked on an incredible DIY balloon garland with lots of colors, which really added to the overall setting. 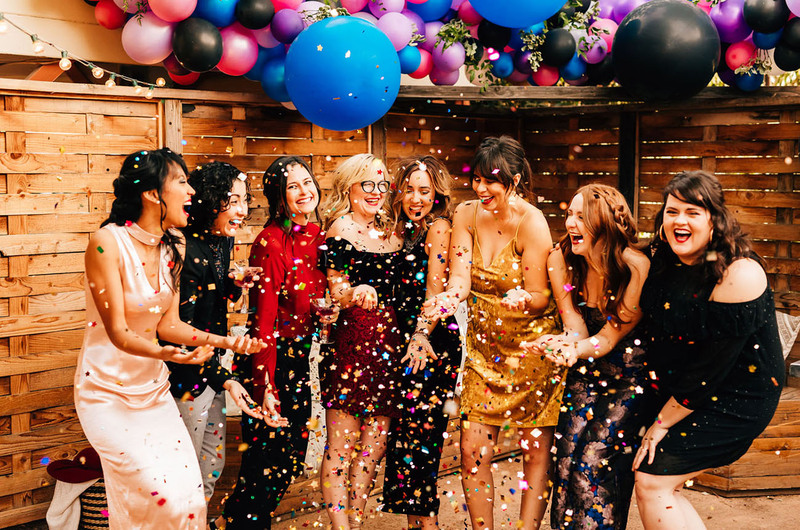 We used balloons from our local party store, fishing line, and double sided tape the create the garland of our NYE dreams! Pretty ultraviolet blooms peeking in by Form Floral! Step 3. Splurge on Your Candles! 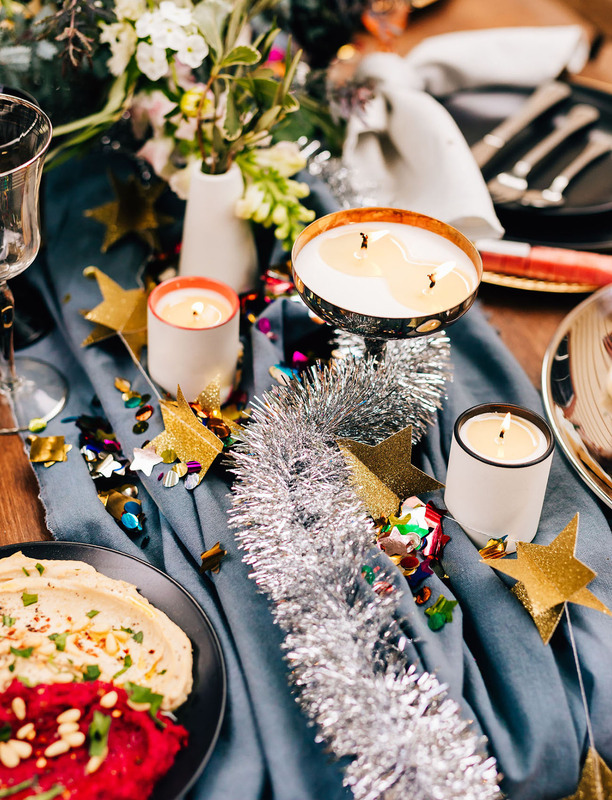 : Skip the big stores and hit up a small candle company to use on your table this holiday season rather than a quick burning candle. Standard Wax has small and large candles, which can burn up to 70 hours! Meaning, if you have a 2 hour dinner, you’ve still got quite a lot of wax in that candle! You can use these as guest gifts or place them around your home afterwards to fill your space with something that is aesthetically pleasing and smells great. We always use a candle that can be repurposed for our home or next event rather than a taper or tea light that burn out that evening. Step 4. 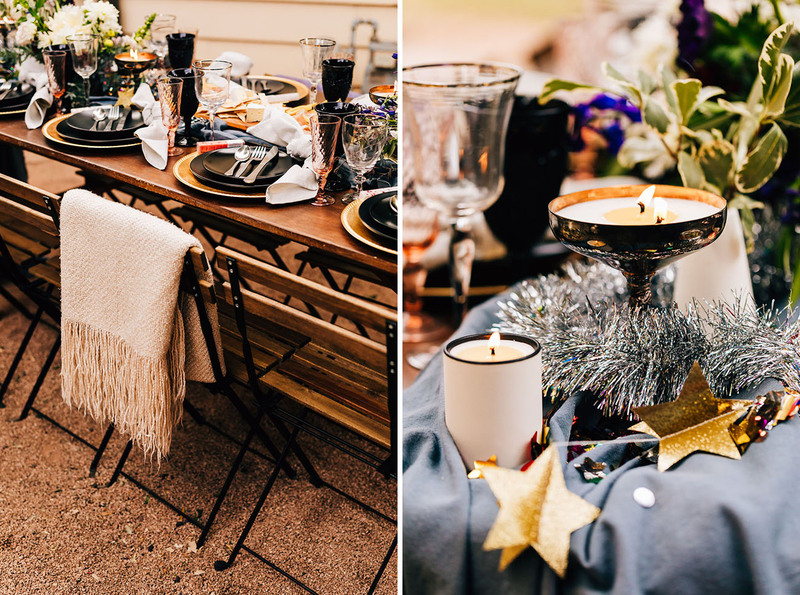 Skip Out on the Greenery Garland: Okay, we are the first to say that a pretty garland can add SO much to a table, but why not play around with some smaller flower arrangements. We think keeping 1-3 small/medium arrangements on your table makes so much more sense than a full greenery garland taking up more room than necessary. You may end up spending the same amount anyways, but the flowers will add some much needed color & textures to your table. Not sure what type of arrangements you are looking for? 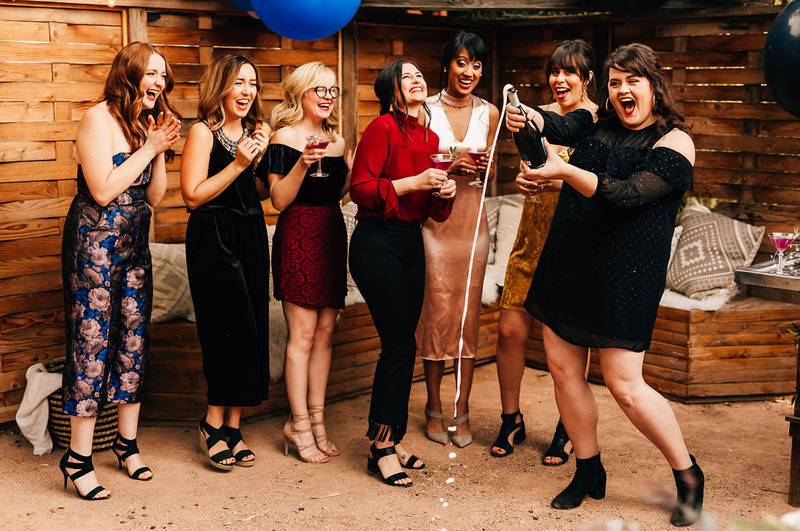 Reach out to a local wedding or event florist to see if they do arrangements for the holidays and get some inspiration from the professionals! Yummy desserts from Voyager Bakeshop! 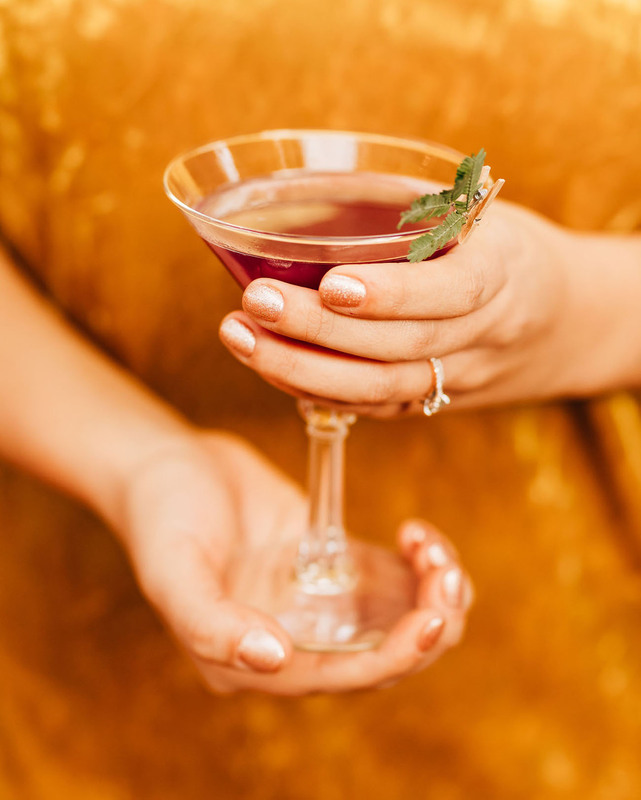 And we are so excited to share this gorgeous Ultra-Violet cocktail from Iconic Cocktail Co.! 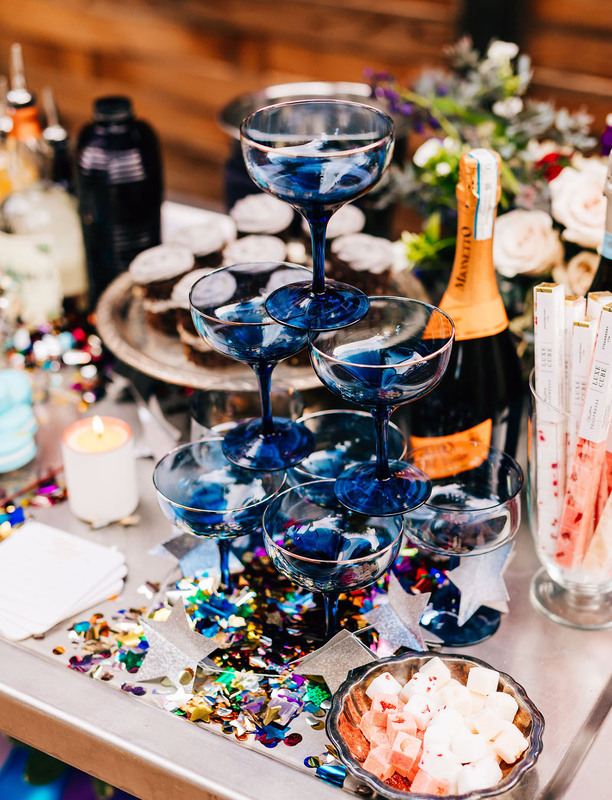 One special thing about this recipe is that with your own homemade blue curacao, and the addition of Butterfly Pea Flower instead of blue food coloring (typically in blue curacao) this cocktail will change colors! Yep. Pretty magical! 2. 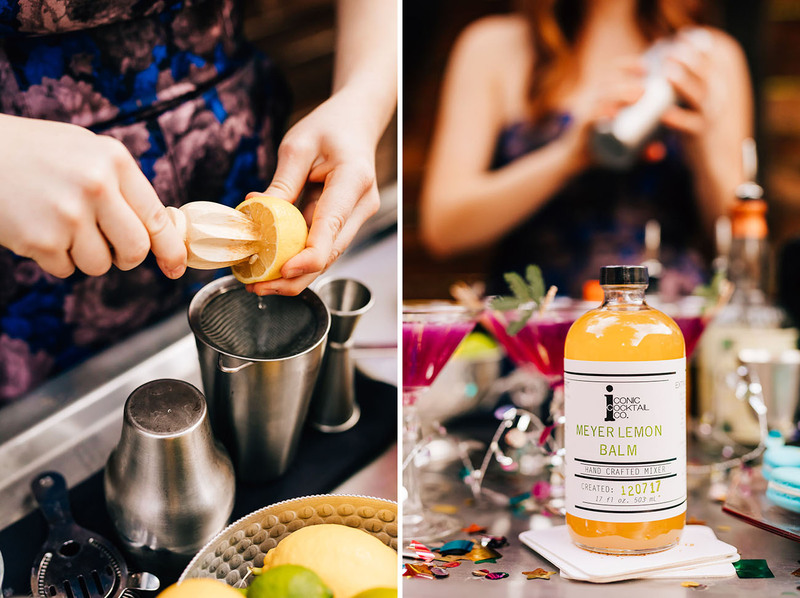 Let infuse for 5-10 days (does not need to be refrigerated.) Stir at least once a day. 3. Strain through a filter. Add water and sugar and stir until the sugar is dissolved. 4. Store in a glass container in the refrigerated for up to one year. 2. Strain into a chilled coup. Super fun action shot from Luna Bear Studios! 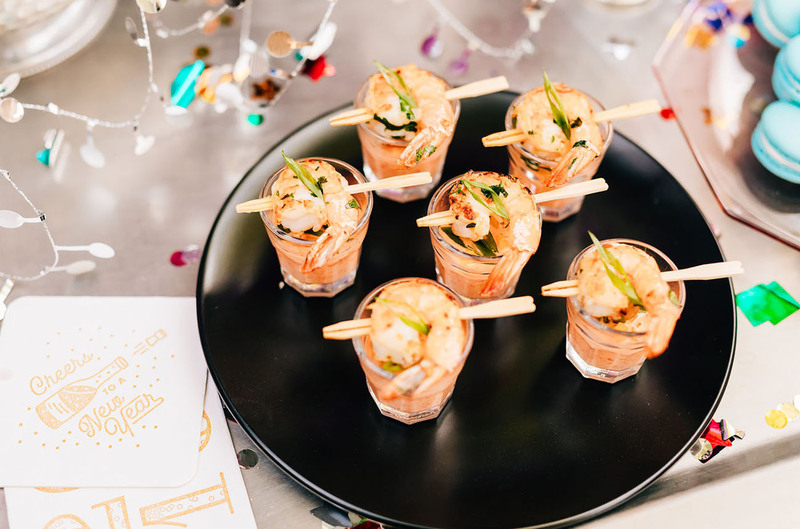 Pretty bites by Brendan McCaskey – almost too pretty to eat? Nah! 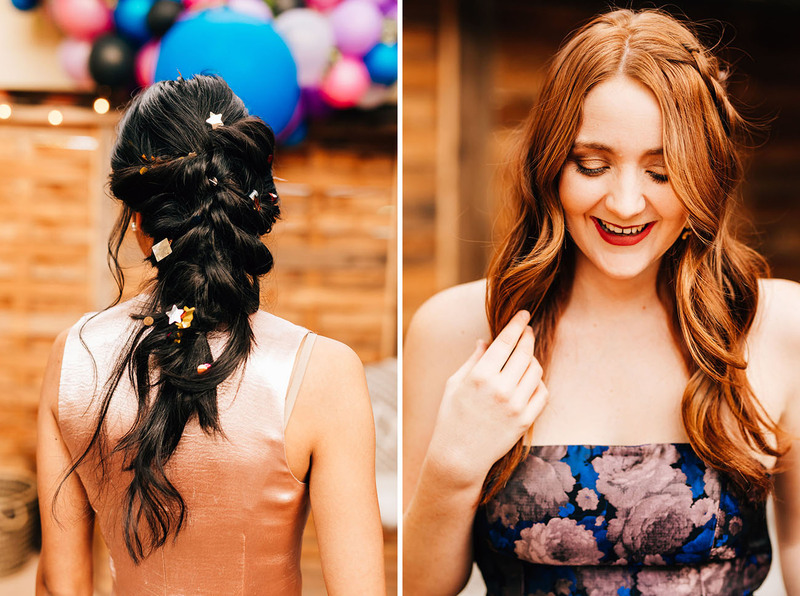 Loving these stylish hair + makeup looks by Braids & Bobbypins! So festive! Step 5. Be Purposeful, Not Perfect: Your party doesn’t need to be perfect, but be sure to make it purposeful. Holidays are all about spending quality time with people you love and are thankful for. Be sure to share why you’re thankful for those people in your life. And if throwing a really beautiful and nice dinner is your way to show them how much you care about them, go for it. Just don’t let it take over your day. 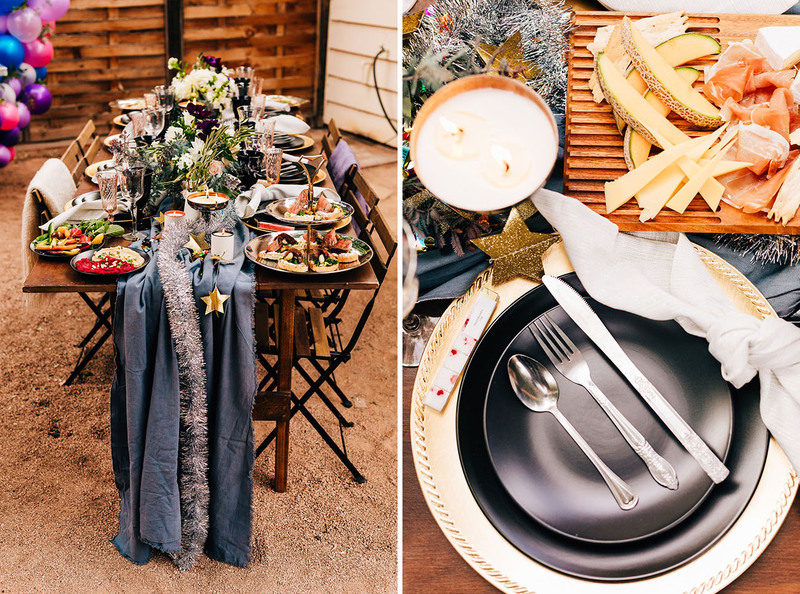 I would much rather eat on a paper plate with disposable flatware than go above and beyond just to wear myself out and be too tired to spend time with my guests. Love that last one! Hope you all have a rad NYE with your friends + family this weekend! 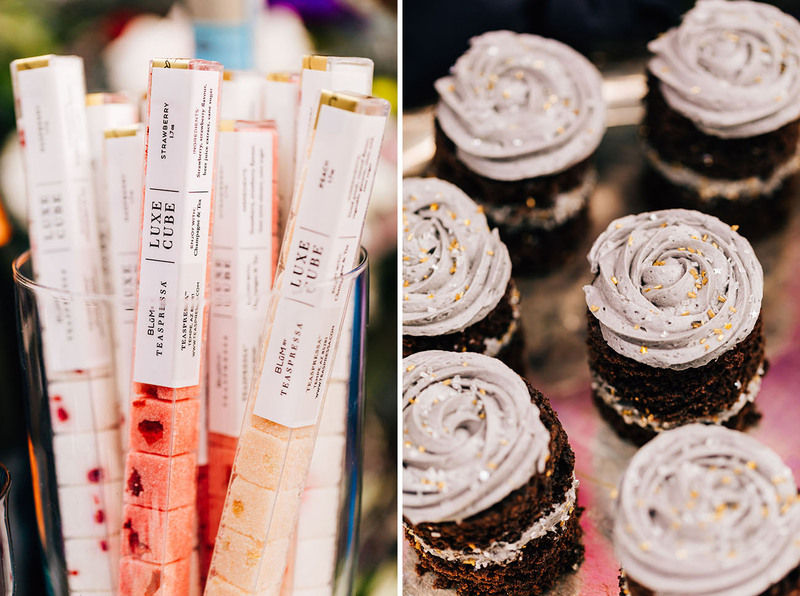 photography: Luna Bear Studios // event design: Leah Theodosis // florals: Form Floral // hair stylist: Braids & Bobbypins // makeup artist: Braids & Bobbypins // paper goods: Prickly Pear Paper // catering: Brendan McCaskey // desserts: Voyager Bakeshop // tabletop rentals: Tremaine Events // furniture rentals: Tremaine Events // linen rentals: Form Floral // sugar cubes: Teaspressa // candles: Standard Wax // cocktails: Iconic Cocktail Co.